Assassin’s creed reimagined - Whether you are a long-time fan of Assassin’s Creed, or a newcomer, Assassin’s Creed Chronicles lets you discover what has made the franchise one of the most celebrated in video game history in a fresh genre for the series. Each chapter is a new beginning and comes with a unique hero from the Assassin’s Creed universe in a never-seen-before setting. While each Assassin’s story stands on its own, the chronicle is tied together narratively. 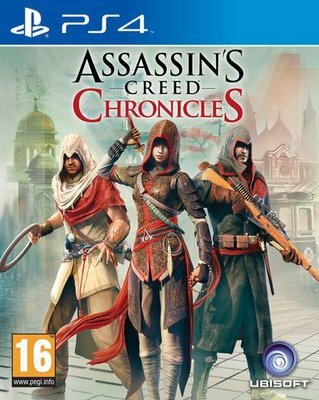 Stealth takes on a new dimension - Assassin’s Creed Chronicles brings the thrill of being a Master Assassin to 2.5D. Scout, sneak, and hide to avoid detection. Fool your enemies by using whistles and disguises. Find your target, kill, and escape. Experience a fast and fluid assault course - As in every Assassin’s Creed experience, freedom of movement is essential. Whether you’re running from danger, scaling obstacles, or climbing stealthily, you will feel that you really can do anything. Master three different combat styles - Should you fail to go undetected, you can always take enemies out with style. Each Assassin is equipped with a powerful range of weapons and distinct gadgets, making every experience unique, with a wide assortment of abilities in your arsenal. Navigate multiple planes - Switch between fore, mid, and background environments and choose different paths according to your needs. Open new pathways, complete side missions, grab hidden collectibles, or take the quickest path to your target.